1.e4 This game was played in Round Five and I was rated almost 300 points lower than my opponent. Alexander Chernin was known as one of the strongest 'French defense’ players (1... e6) in the world. I was only 14 but had already won the first four games. To my surprise, my opponent opened with the Sicilian. He wanted to take me out of the book on the first move. Little did he know that of all openings, I feel most comfortable playing the Sicilian. 1...c5 This is a modern opening, where black tries to attack the center from the side rather than occupying it right away. 2.Nf3 e6 3.d4 cxd4 4.Nxd4 Nc6 5.Nc3 Qc7 6.Be2 Nf6 7.0–0 Be7 8.Be3 0–0 9.f4 White’s main plan in this setup is to push the e and f pawns ahead followed by a kingside attack. 9...d6 This is the Scheveningen variation. If you weren't born in Holland, don't even try to pronounce it! 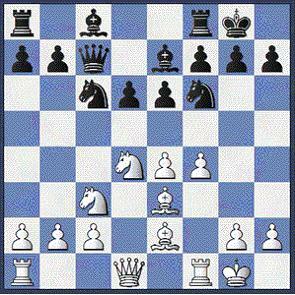 10.Kh1Once f4 is played, it's useful to have the king out of the a7-g1 diagonal, to avoid unpleasant surprises. For example: 10.Qe1 Nxd4! 11.Bxd4 e5! 12.fxe5 dxe5 13.Qg3 This is a nice trick with a pin against the e5 pawn, but now black has a counter pin with: 13...Bc5!= 14.Bxc5 Qxc5+ and white doesn't have the time to capture the knight on f6, because of the check. 10...a6 Preparing b5. Black wants to play in the center against the e4 pawn and push d5, as well as play on the c file. For all these plans, chasing the knight from c3 with b5-b4 is very useful. 11...Na5?! More experienced players in the Sicilian prefer taking 11...Nxd4!? 12.Bxd4 b5! ; The immediate 11...b5 would weaken the long diagonal and give white a good play after 12.Nxc6 Qxc6 13.e5 Suddenly the bishop can appear on f3 threatening any piece that is on the h1–a8 diagonal. 12.Qg3?! I was eager to have my queen on the attack. But it was better to get the rook out of the corner first with 12.Rd1! 12...Nc4 With a double attack on bishop and pawn, the bishop is forced back to the starting position. 13.Bc1 My idea was to bring the bishop back to the game from the other side after b3. 13...b5 14.a3 Qb6?! 15.Rd1 Bb7? Black's next move is most logical, since it continues development and attacks the center, but it's too slow. Black's best chance was to sacrifice a pawn for the initiative: 15...e5! 16.Bxc4! (16.fxe5 dxe5 17.Bh6? Nh5! 18.Bxh5 Qxh6–+) 16...bxc4 17.fxe5 dxe5 18.Qxe5 Re8 19.Qg3 Bd6 with compensation for the pawn. 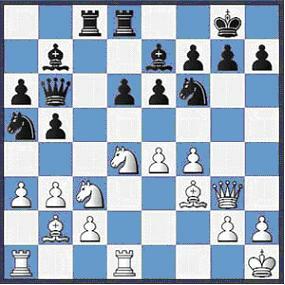 18.Bb2 Now all white pieces are developed in harmony; there are tactics in the air. With the bishop on the long diagonal, "only" the knights prevent a devastating attack on g7 against the black king. Chernin totally missed the following combination. 18...Rfd8? 18...Rfe8!? would be better. In this kind of setup the best placement of the rooks is usually c8 and e8. It's easy to see why having a rook on the semi-open c file is good. Having a rook on the e8 is good, particularly when the e file opens up after black's d5 move and an exchange of e pawns. Sometimes this move only gives space for the bishop to retreat to f8 for kingside defense. 19.Nd5! This is a typical Sicilian sacrifice, exploiting the weakness of the e6 pawn. The e6 pawn is overloaded and can't control both f5 and d5 squares at the same time. One knight is out of the diagonal now! 20.Nxe6! Now all three knights are out of the way from the long diagonal, and on top of the mating threat on g7, the rook is also attacked. 20...g6 Escaping the mate for now, we see why Rfd8 was so costly for black on move 18. 21.Nxd8 Qxd8 22.exd5 After all the exchanges in the last few moves, white is up an exchange. 23...Bh4 24.Qh3 Bc8 25.Bg4 Bxg4 26.Qxg4 Nxb3 27.g3?! 27.f5 was a better way to continue. Weakening the pawn structure around the king has its dangers here too. 28...a5? This was the last mistake in the game. Black would have had some drawing chances after 28...Qc8! 29.Qe4 Qxf5 30.Qxf5 gxf5 The black rook on the second is very powerful and gives compensation for the exchange. 29.fxg6 hxg6 30.Qh3! The bishop is just too strong now, threatening mate in one. If 30...Bf6 31.Bxf6 Qxf6 after 32.Rxb3 the rook protects the f3 squares and white is a rook up now. 30...Rxb2 31.Rxb2 a4 32.Rf2 Nc5 33.Rdf1 Doubling the rooks maximizes their strength. 33...f5 34.g4! After opening the files on the king there's no defense. 34...Ne4 35.Rg2 Bf6 1–0 When making this move, black's flag fell, which means he lost on time. The position is totally lost after 36.gxf5: white is too far ahead in material and the king has no escape.